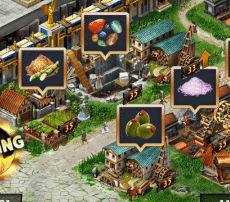 Your stronghold, and most internal buildings, can now be upgraded to level 35. Enjoy scaring your enemies with a formidable rally size of 150,000,000 and learn more about your opponent with advanced scout reports. Using the new construction gear Master Mason’s Gear Set (which grants you 40k opalite glass reduction, 426% construction speed along with 6250 reduction for master hammers/stone columns/brass rods) to upgrade your buildings to thirty five. With this gear, upgrading up to level 33 will have zero cost for your villas, barracks, hospitals and resource buildings. NOTE: Upgrading your farm to level 35 & Villa gives you the ability to produce the new type of resources. I used to love this game, would play everywhere I went, but the last couple months, I got tired of chasing my tail. I’ve spent a lot of money in this game, I didn’t mind, it was worth it and I would have spent it somewhere else, but damn. Anyways, a real nice fella from the Netherlands who loves the game but doesn’t/can’t spend, just inherited a 100T account, cause enough is enough. I liked it when 21 was tops and all was equal.